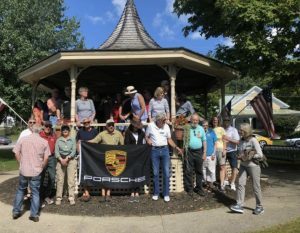 The July 14th Tour has been planned to be a day of fun driving, some good food, and time with Porsche Club friends, old and new!! Bernie and I have planned the route, driven all the roads, and identified places for lunch, pull over locations after the intersections, and photo stops WITH rest rooms. Please read this information carefully, and after reading, please RSVP so we’ll be able to plan the day, and possibly, for those interested, set up a lunch option. The July tour will consist of a day of driving (3.5 hours of drive time) through the scenic White Mountains of the White Mountain National Forest. and will include additional times for some interesting photo opportunities, as well as a stop for good food at the historic Mt. Washington Hotel, in Bretton Woods, NH. The tour will start at the P&H Truck stop in Wells River, VT. The stop is right off Exit 17 of Interstate 91 in VT. The tour will start at 9:30 am; please plan to be there early, especially if you want a good breakfast! The P&H truck stop is a regional legend, and offers some great breakfast options with their own homemade breads. Those who want to really make the day a food experience might want to get there between 7:30-8 am and plan on a breakfast at the stop. The dining area is large, seats a lot of people, and you can be assured of good coffee and very clean (Bernie approved) rest rooms. The drive will follow route 302 in to NH for a short distance, and will then turn on to NH route 112, the Kancamagus Highway through the White Mountain National Forest to Conway, NH. There are several nice scenic vistas on the Kancamagus drive that will present some photo opportunities for the club. We plan to stop at the Hancock Trail head vista, about an hour and 5 minute drive from the truck stop, for the first photo and a rest room stop. We won’t be in a hurry, so can stop at another vista for a short break and walk as well. Parking at the vistas is ample. Upon reaching Conway, we’ll turn north on to NH Route 16/302 to N.Conway, and then follow 302 to Bretton Woods, where we’ll stop for an early lunch. Lunch will be served at Fabyan’s Restaurant – which is the old train station at Bretton Woods (about a mile past the large old hotel). It’s been redone, owned by the hotel, and has similar menus. They’ll have tables for us, order as you wish off the menu. After lunch we’ll continue the drive on Route 302 back to Wells River. The total drive is 137 miles, driving time of 3.5 hours not counting stops – the first part of the drive from Wells River to the lunch break at Mt. Washington Hotel is the longest, especially taking extra time to stop and enjoy the views. The last leg of the drive is shortest. We plan to return to Wells River by 4pm. For those who are interested, here’s a link to Google Maps which will show you the entire route we’ve planned. We hope to see you on the White Mountain Drive – please RSVP to let us know if you’ll be attending the drive and lunch. Lunch details TBD.